What’s an old train depot have to do with welding school? For so long we’ve been focusing on getting kids into college–but the trend may be shifting. Trade school attendance won’t leave you crippled with six-figure student loans and you’ll graduate with skills (like welding!) that are in demand. 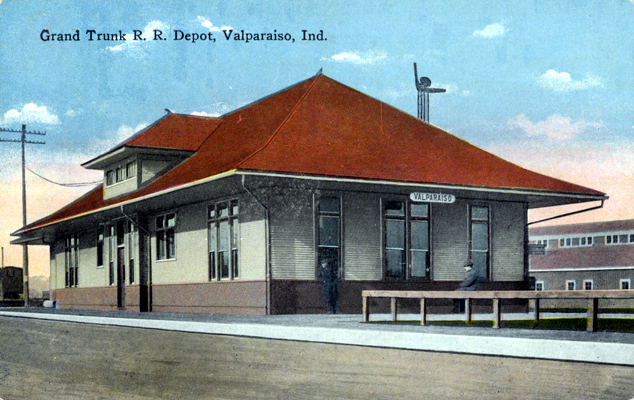 In Indiana, enrollment in trade schools is on the rise and in fact, the Porter County Career and Technical Education center (which includes a welding school) has found a creative way to increase their classroom space–by using this old train depot--which they moved from its original location in Valparaiso, Indiana. The 104-year-old Grand Trunk Railroad train depot sits on the south edge of the Porter County Career and Technical Education center parking lot, a relic of another time. But this fall, it will serve as a learning lab for students in the building trades and electrical and other programs who will convert it into new classroom space as they learn skills needed in today’s economy. The approach has been sorely needed for some time, according to Jon Groth, center director, as career and technical education programs are growing in enrollment across Northwest Indiana. PCCTE serves more than 1,100 students in Porter County as well as the School City of Hobart, with classes offered at most of the high schools as well as the center and Ivy Tech Community College’s Valparaiso campus. Career and technical education programs are growing as more students realize they provide a smoother pathway to a career and don’t require taking on the loan debt of a four-year college. And if you’re heading back to welding school, be sure to check out our list of welding safety products you’ll need to get started. And check out Arc-Zone’s web store to find everything from welding safety apparel, helmets, safety goggles, respirators, heat safety gear, and welding gloves. Check out the ARC ARMOR™ line of performance engineered safety products from Miller®. Arc-Zone.com carries the functional protective clothing from the safety experts at Revco Industries– including the BSX line of Xtreme welding wear, and the AngelFire® premium welding gear designed specifically for women fabricators. You can head to welding school rigged up for safety, and looking good too.